FORT LAUDERDALE, Florida, USA - TRMC, the .travel Registry, is pleased and gratified that the MATTA.travel website, the signature booking portal for the Malaysian Association of Tour and Travel Agents is doing so well. Joining country portals such as Egypt.travel and Germany.travel, MATTA.travel has embraced the value of the clear travel and tourism identity that the .travel top level domain provides. Byron Henderson, Managing Director of .travel, noted that "MATTA has been a long-time supporter of the .travel Registry and the .travel initiative to improve the reach of the travel and tourism industry on the Internet. 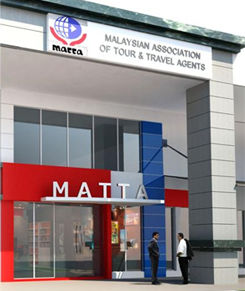 MATTA's leadership in offering travel packages through its own portal under its .travel name introduces a new level of service to their members." In a world of more than 1,000 top level domains, MATTA's choice, at this moment, shows that as the Internet grows and segments, a clear domain name identity is one of the best marketing investments a business can make. Follow the .travel Registry on Facebook ( https://www.facebook.com/dotTraveldomains ), Twitter ( https://twitter.com/dottravel ), and on other social media, or visit their web site at www.travel.travel/ .